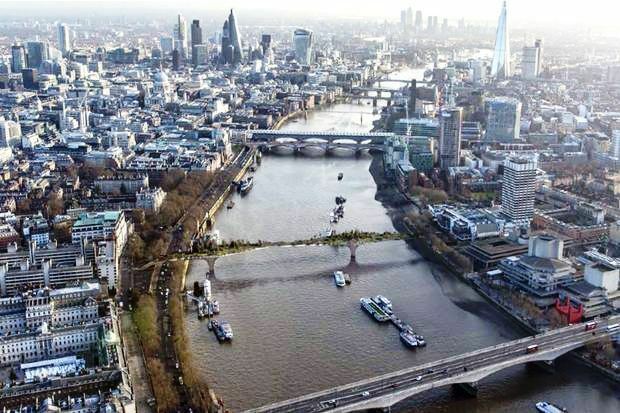 Following Transport for London’s (TfL) tender for proposals to improve pedestrian links across the river, Heatherwick Studio and actor and campaigner Joanna Lumley have developed an idea for a new pedestrian ‘Garden Bridge’ across the River Thames; a scheme to connect North and South London with a garden. The ‘Iconic’ Thames project – the Garden Bridge over the Thames, was approved and granted planning permission by Lambeth council last Monday. The project has also received huge approval from Londoners – 88 per cent of people who live in the capital and 94 per cent who live outside it. The £150 million structure — designed by Thomas Heatherwick, mastermind of the London Olympics cauldron — will span the river between Temple and the South Bank. The bridge will contain 270 trees representing 45 species, as well as shrubs, climbing plants, hedges and flowers. It is believed that the bridge will become a key landmark and tourist attraction linking both riverbanks. Crossing the bridge — more than 90ft wide in places — will be a “transitional experience”. The sections will include marshland, ornamental gardens, wild glades, fruit trees, evergreens, clifftop plants and pines. All the species have been selected for their ability to thrive in an exposed, windy setting. Seating will be provided — but with an “irregular top surface” to discourage rough sleepers from colonising the bridge, which will be lit after dark to let evening walkers enjoy the gardens. The bridge will open from 6am until midnight and use will be free. Construction could begin in December next year if the necessary funding can be raised. So far more than £90 million has been pledged by the Government, Transport for London and private donors. It is hoped the bridge will open to the public in 2018.